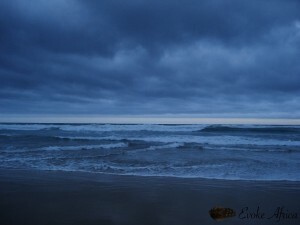 When looking for a photograph that would be appropriate to post for World Oceans Day (08/06/2011) I came across a set of photographs that I took on Wilderness Beach, South Africa in April 2010. Despite the fact that we often base ourselves in Wilderness – a small, unassuming holiday town along the Garden Route – I realised that I rarely give it much thought. But looking at this photograph, an overwhelming sense of peace washed over me, and for a second I was transported back to this massive, deserted beach; listening to the tumbling waves and feeling the cool, salty air. I’m afraid that I have taken Wilderness for granted. It’s not the most spectacular destination that South Africa has to offer, but on that beach, at that moment, it was the most perfect place to be. Looking at that photo, I realised that I haven’t felt that calm since. And for the first time, I had the conscious thought… “I hope that I’m fortunate enough to be back in Wilderness soon”. I agree, lots of more scenic places on the Garden Route. But as you said, Wilderness gives you peace and calm. I live in Wilderness and you are more than welcome to visit one day. Naomi on How you can help us keep our New Year Resolutions!